Onlaid pieces of thinly pared leather have been used for decorative effect by binders over many centuries. Most commonly, the onlays fill the area within a gold- or blind-tooled impression. Onlays can create both abstract graphic and pictorial binding designs. 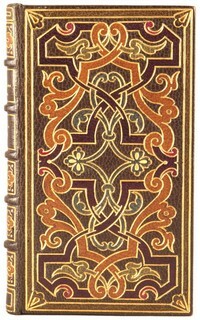 A nineteenth-century Grolieresque binding by the Belgian binder De Samblancx-Weckesser. 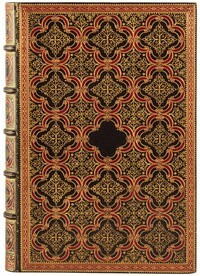 Published: Leiden, Netherlands: Jean and Daniel Elzevir, 1653. Francis Bedford ran a highly productive West End bindery in nineteenth-century London. Along with more common bindings in full goatskin with gilt spines, Bedford created some exceptional bindings, often in retrospective styles. Published: London: Printed for T. Cadell and E. Moxon, 1834. Green goatskin with multicolored onlays by the nineteenth-century London binder W. T. Morrell. 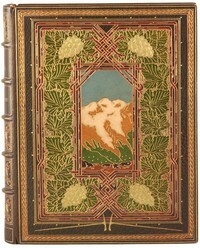 A jeweled binding by Sangorski and Sutcliffe. George Sutcliffe, who studied bookbinding under Douglas Cockerell, established a bindery with with Francis Sangorski in 1901. 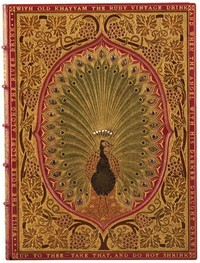 During the first two decades of the twentieth century the pair produced a number of jeweled bindings, most of them on copies of the Rubaiyat of Omar Khayyam. The most sumptuous of these jeweled bindings, now referred to as 'the Great Omar,' never reached the American collector who commissioned it, having been entrusted to the maiden voyage of the Titanic. Title: Rubáiyát of Omar Khayyám. Published: London: Bernard Quaritch, 1872.